Casa Romantica is a beautiful private holiday villa and swimming pool set in its own private walled grounds. 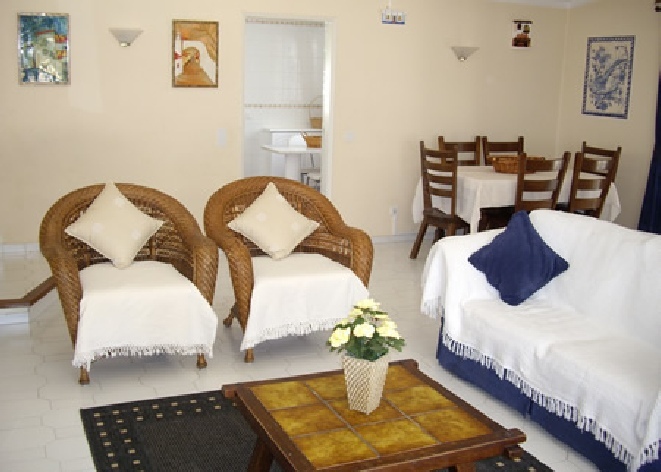 It is in perfect destination for family holidays in the algarve as it is within a close distance to family friendly restaurants, beaches, water parks, mini-markets and the old town of Albufeira. 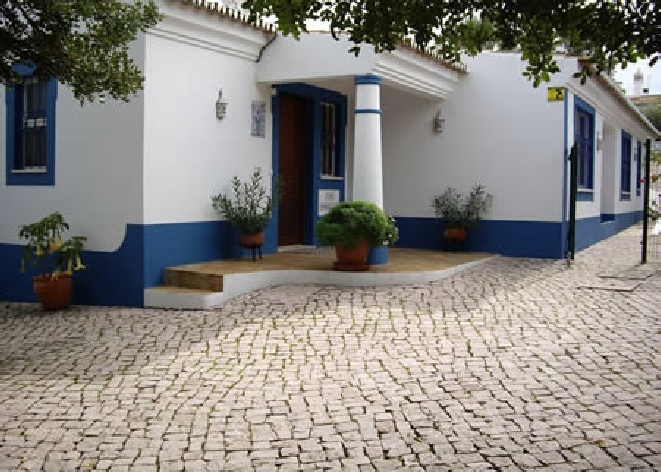 This luxury villa in Guia offers great private villa rental algarve accommodation and is 30 mins from Faro airport, either by hiring a car or pre-booking a taxi from the airport. Guia's village life is quiet and peaceful with local mini-markets, good value restaurants and bars all within walking distance of the villa. Whilst the main Algarve Shopping Centre with it's bowling alleys, cinemas, shops and restaurants are only a few minutes drive away. 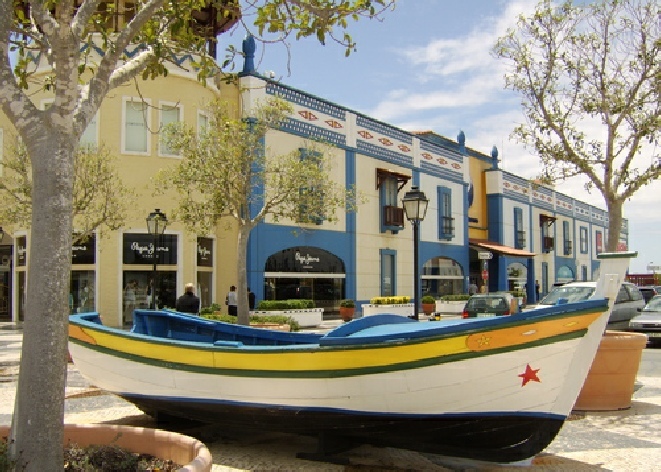 A large Continente supermarket is also at the algarve shopping centre. 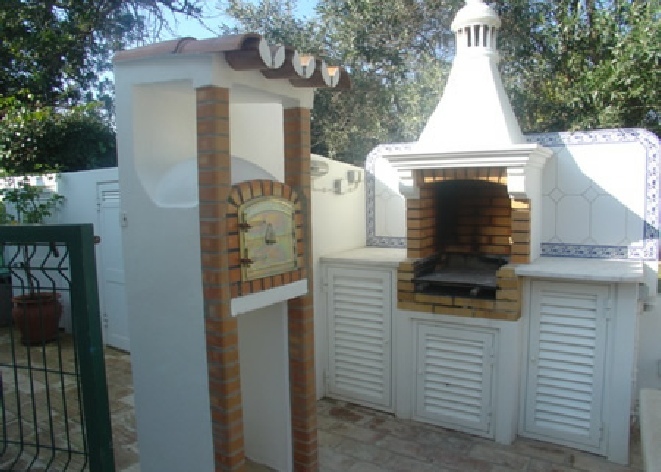 Guia is home to the famous chicken piri-piri restaurants, vineyards, almond and orange groves. Only a few minutes drive away the local beaches of Praia da Gale and Sir Cliff Richard’s home and Adega Do Cantor vineyard where he makes his Vida Nova wine. The living room has SKY TV with the BBC and ITV channels. The main living room also has a CD player. The living room has a large dining table, which can seat up to 8 people. There are large patio doors, which lead out to the pool. It is possible to have the patio door open, but still prevent young children from being able to get to the pool as the patio doors have ornate wrought iron gates on them, which can be locked. There is a wood-burning stove and electric plug in oil heaters for winter rentals. The living room does have air conditioning available for heating and cooling. Off the main living area there is also a small room for children to play in, which has got an Xbox 360 and separate TV. There is a large cupboard full of childrens toys in their play room. There is a fully fitted modern kitchen with all appliances included (fridge/freezer, washing machine, dishwasher, gas oven, micro-wave, toaster, kettle, etc). There is also a built-in marble breakfast table and seating area. From the kitchen it is possible to go outside to the barbeque and outside dining area. The kitchen has air-conditioning. There are 1 double bedroom with a Super King bed. 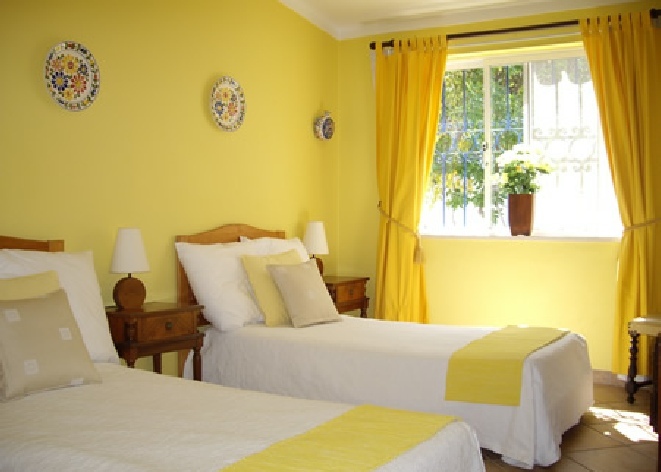 The double bedroom also has a private fully tiled ensuite bathroom with twin sinks, bath, bidet, and shower. 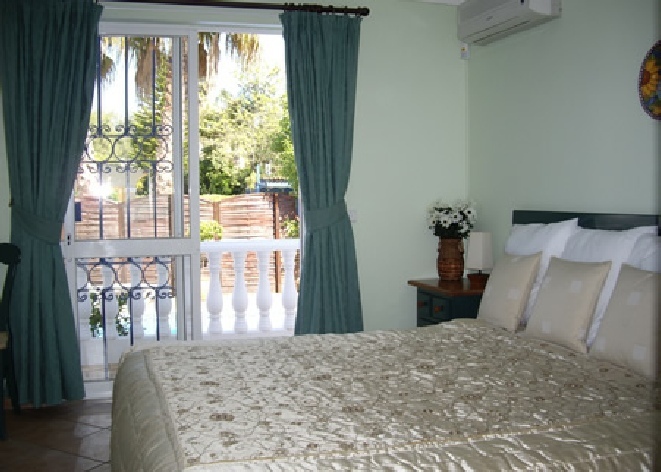 The double bedroom has patio doors leading to the private pool. All the bedrooms have built-in wardrobes, air-conditioning and the option to use insect screens on the windows. The air-conditioning units also have remote controls. An hair dryer is provided in the room. There are also electric plug in oil heaters for winter rentals. The first twin bedroom has two single beds, air-conditioning, built-in wardrobes and the option to use insect screens on the windows. The air-conditioning units also have remote controls. An hair dryer is provided in the room. There are also electric plug in oil heaters for winter rentals. The second twin bedroom has two single beds, air-conditioning, built-in wardrobes and the option to use insect screens on the windows. The air-conditioning units also have remote controls. 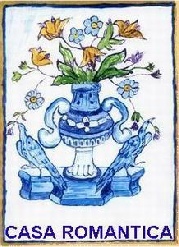 An hair dryer is provided in the room. There are also electric plug in oil heaters for winter rentals. There is a large sofa bed in the living room, which can sleep 2 people comfortably. We also have additional temporary fold up camps beds for small children. There is also a fully tiled family bathroom with twin sinks, bath, bidet and shower. There is also a further fully tiled shower room with a large sink and shower. There is a private 9m x 5m mosiac swimming pool, which has a shallow end and a deep end. There are steps down into the shallow end. The shallow end of the pool is 1 metre deep and the deep end is 2 metres deep. The shallow end is big enough for younger children to be able to play safely. The pool has an inside light for swimming during the evening. There is also an outside shower by the pool. The swimming pool can be heated for an additional charge. There is a pool cover for helping to remain the heat in the pool overnight. There villa is in it's own grounds, which is all walled. There are several shaded areas to eat outside, both by the pool side and at the rear of the villa where there is a coal barbeque and large marble seating area next to the kitchen.All equipment for the barbeque is provided. 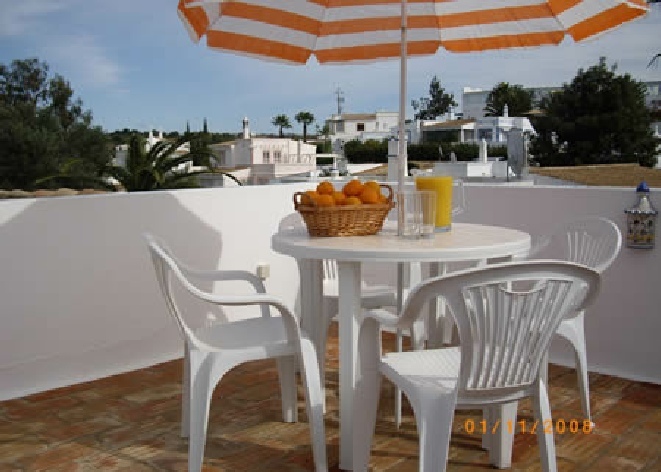 There is a private roof top sun terrace with great panoramic view. There is a small table, chairs and sun parasol. 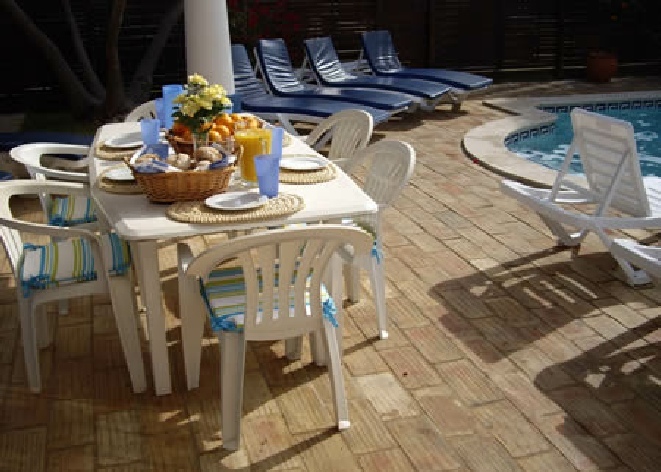 There are plenty of outdoor furniture with chairs, tables, eight sun loungers and sun parasols. 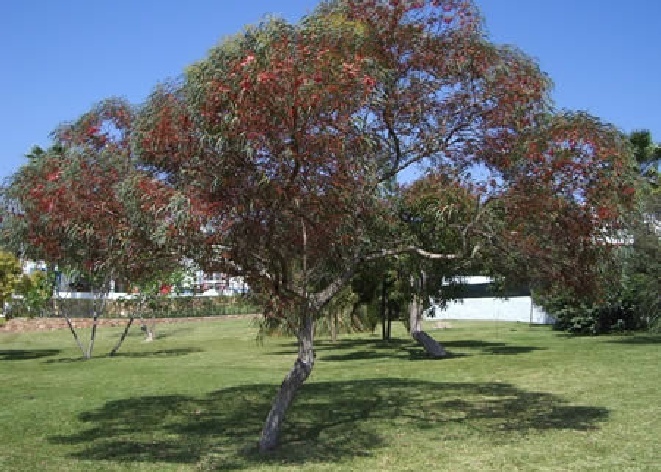 Casa Romantica has its own carob tree and over hanging olive trees. In the local gardens behind the villa (a few minutes walk away) there is a small children’s play area with swings and slides. All towels and bedding for inside the villa are provided. Cots, high-chairs, push chairs and bottle sterilisers for babies are all provided free of charge. There are plenty of books to read and games to play. The villa does have a small safe for personal possessions. A broadband WiFi connection is available from anywhere in the villa and its grounds. 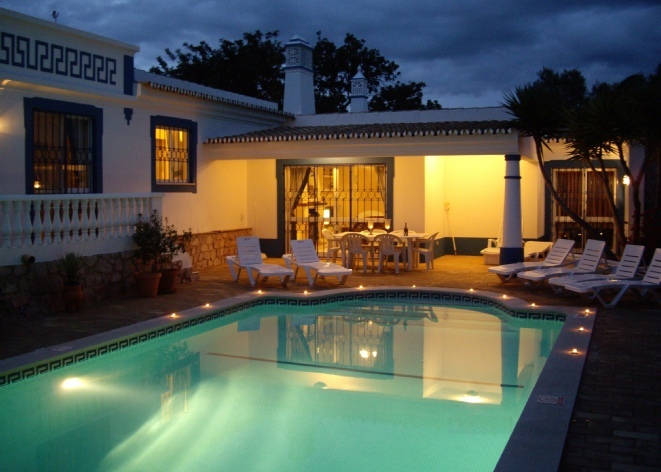 This family villa in Algarve offers bright and spacious family accommodation, set amidst some beautiful scenery and among other white-washed villas in Guia. You have got complete privacy and the villa is located in a tranquil coastal town of Guia and has extensive open and shaded terraces for indoor and outdoor al fresco living. 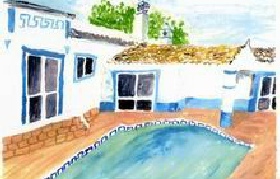 The villa is a beautiful traditional style Portugese property with ample space for 1 or 2 families to share for their Portugal family summer holidays. Please use our Enquiry Form to ask any specific questions that you might have and check our Availability Calendar if you need any specific dates. 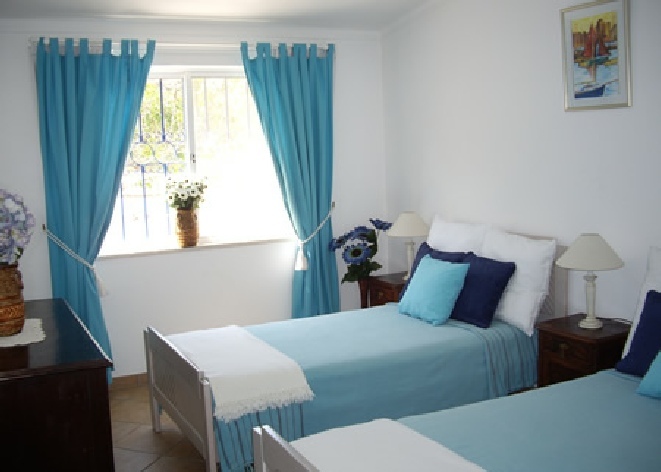 All the bedrooms are light and airy, with practical built-in wardrobes and cupboards. All the bedrooms have remotely controlled air-conditioning. There is plenty of safe storage for all your holiday belongings including golf clubs, tennis rackets, wet suits, etc. 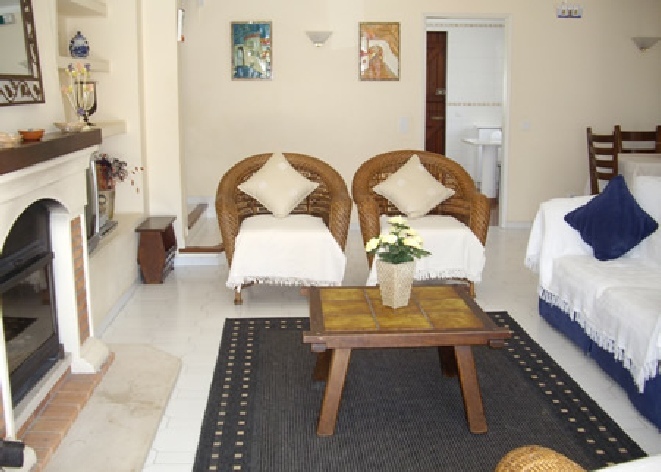 There is an open plan lounge and dining room which is furnished with a television, ipod hi-fi and DVD players. 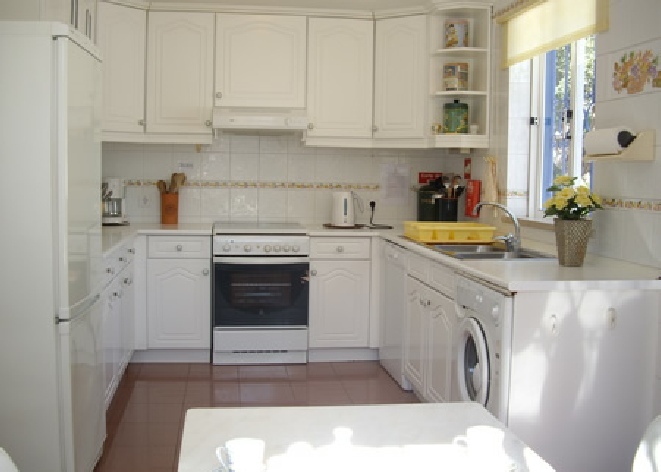 There is a spacious kitchen with ample cupboard space and a double sink. 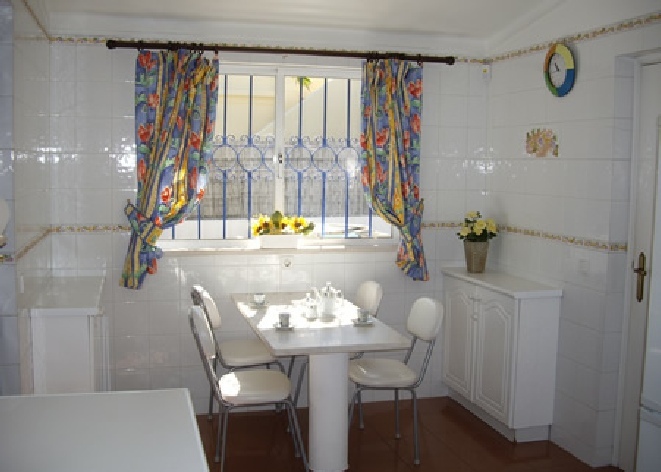 It is fully equipped and includes a gas oven and hob, large fridge freezer, dishwasher and washing machine. The kitchen also has a dining area and easy access to more dining areas outside. 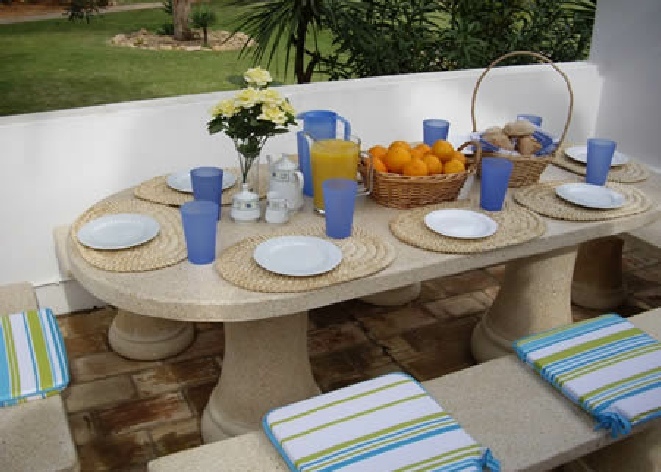 Each morning the sun raises at the back of the villa where you can have breakfast outside. The pool area is sunny all day and has plenty of shaded areas to relax and read a book from the living room. We have published our prices for 2019 and making a booking is very easy. 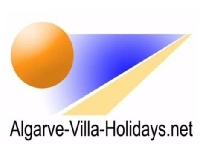 For more information about planning your private villa rental algarve holiday in Guia then go to our Planning Your Holidays information section. Our management company offices are only 0.5 km from the villa. 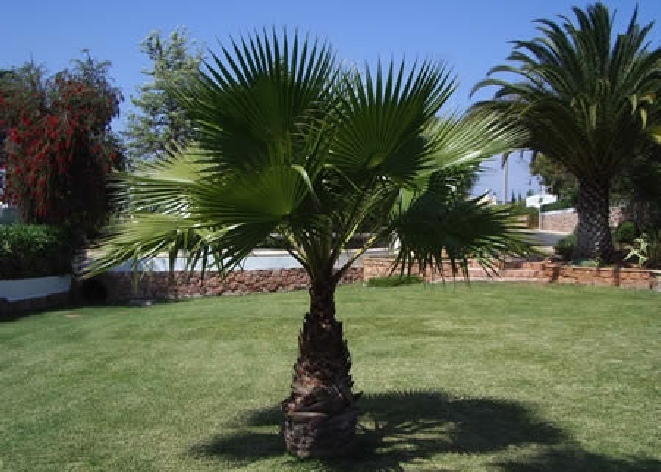 They offer friendly advice, help and assistance to all our guests including a welcome visit to introduce you to the villa and surrounding area. They also sell tickets to waterparks, the Zoomarine, horse riding, golf, boat, fishing trips and excursions at discount prices. 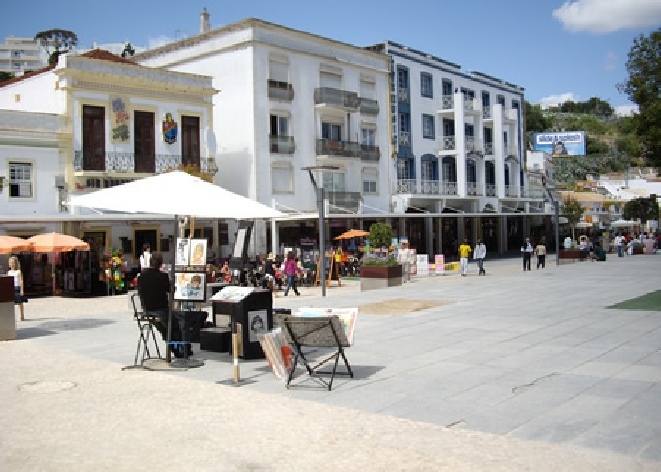 Excursions to the local markets and other places of interest in the Algarve are also available. Have a look at our Guest Book for feedback from our many repeat clients over the last few years. We definitely recommend a day out to Seville and Lisbon, which are fantastic cities. You can buy tickets to most of the above plus much more with a 10% discount from our local Management Office. Take a boat trip to the grottos and rock formations and sea caves. Take a boat trip and race alongside the dolphins. Explore the Monchique mountains and enjoy the historical Roman Spa. Explore the ancient Moorish capital of Silves and walk the ramparts of the 12th century Citadel. Head to the Zoomarine sea life centre in Guia and swim alongside the dolphins. Enjoy the 3 waterparks along the coast, including the 'Slide and Splash' in Lagoa. 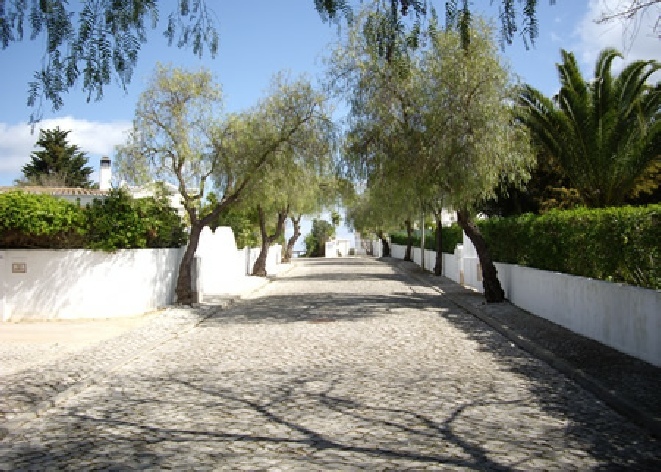 See Central Algarve for more information about the region. 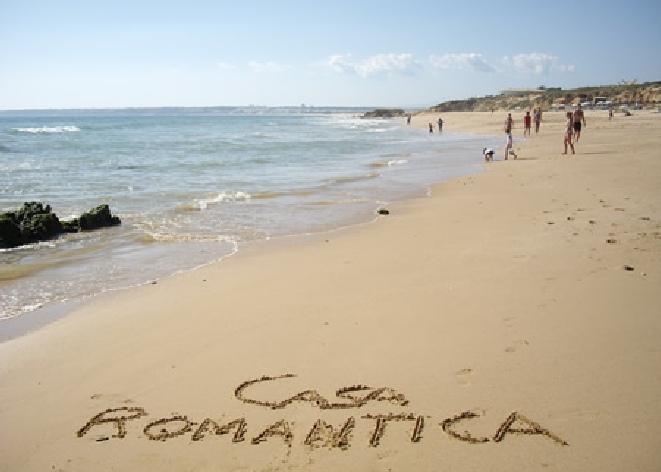 You can also see our Frequently Asked Questions and Answers pages when booking Casa Romantica - a luxury private villa with private pool in Guia near Albufeira. In Portugal algarve family villa holidays can also be spent relaxing by your own private pool with a good book and a glass of wine. 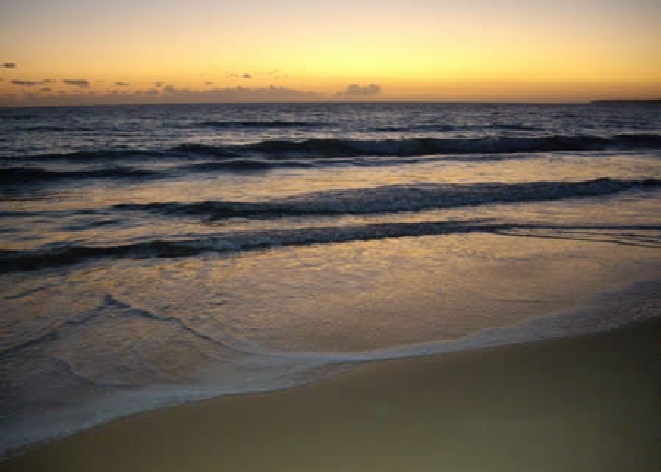 Escaping the stresses of everyday life is what Portugal family summer holidays are all about !